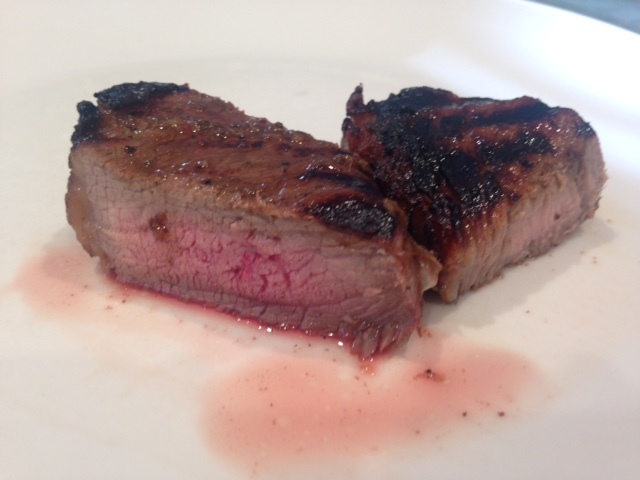 In a recent post, I provided recipes for three methods Maggie and I have added to the repertoire for char-grilling on our Weber Q. Here are two more: one for boneless pieces of lamb leg; the other for thin pieces of veal, marinated with fresh herbs from our garden. 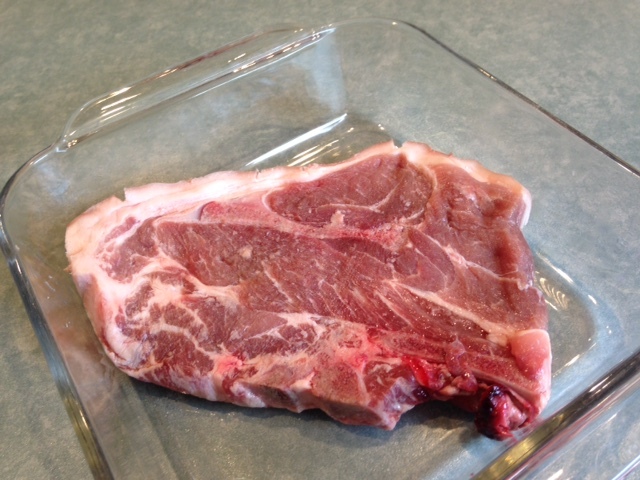 Once you have combined the ingredients in a bowl, you’ll have enough for a piece of lamb up to one kilogram in size. Because there are only the two of us, we buy a whole boned leg and divide it into four portions, each weighing between 500 and 700g. We freeze three of the pieces immediately; of these, the smallest one will eventually be minced for something like lamb kofta. 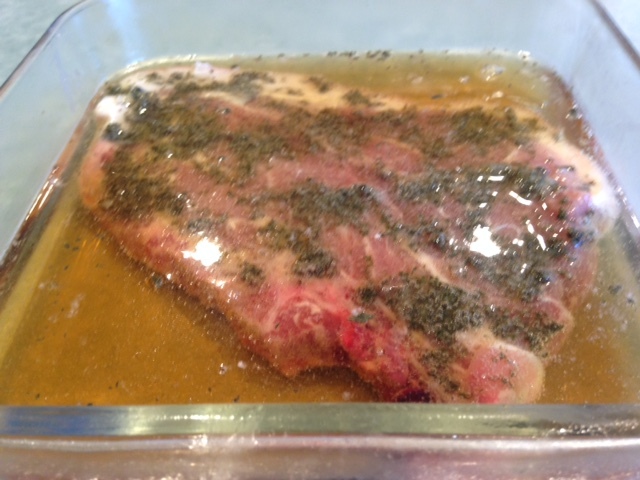 Once the remaining piece has been well coated with the marinade, we cover it with cling wrap, leave it in a cool place for half an our so and then refrigerate it overnight. 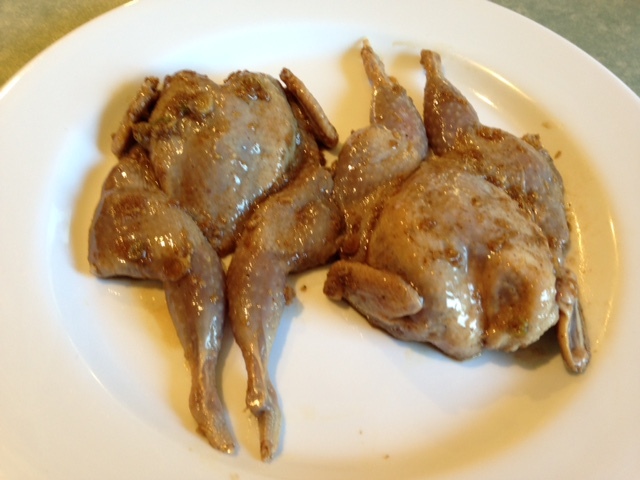 Our cooking method varies significantly from that in the original recipe. 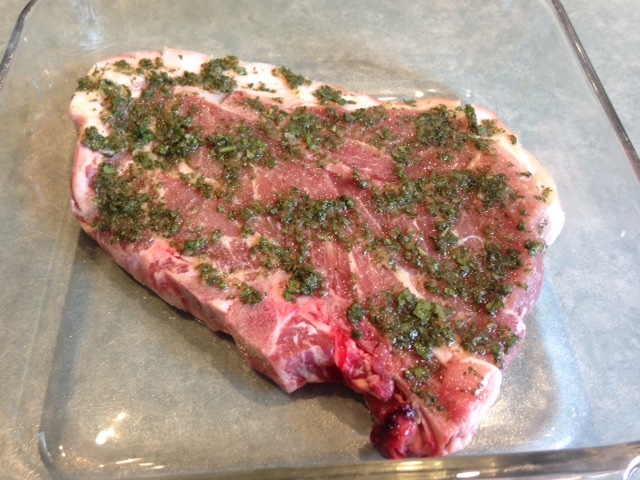 We remove the lamb a good hour before cooking and set up our Weber Q for roasting. 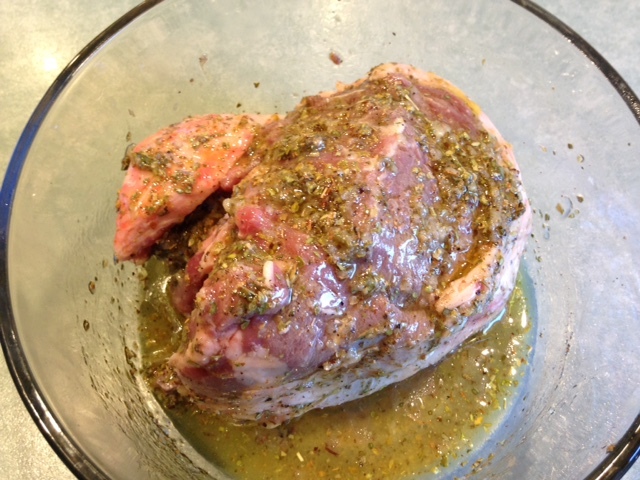 Once the Weber has reached about 180C, we put the lamb in and roast it for about 30 minutes, for a 600g piece. 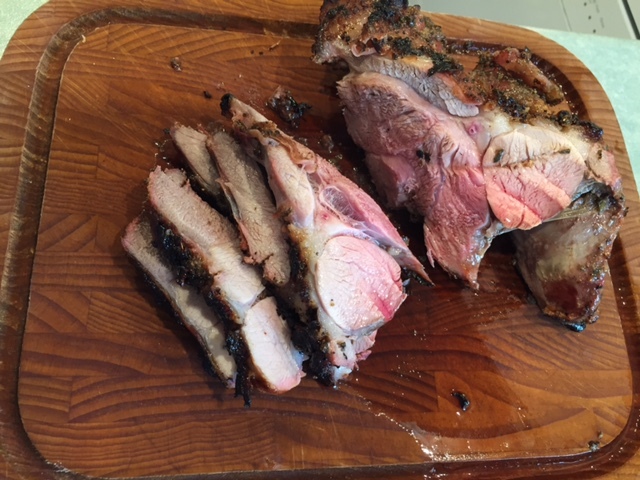 We quickly reset the Weber for grilling, place the lamb skin-side down and cook it for about 6 minutes, turn it over and cook it for a further 3 to 4 minutes. Here is how it turns out! 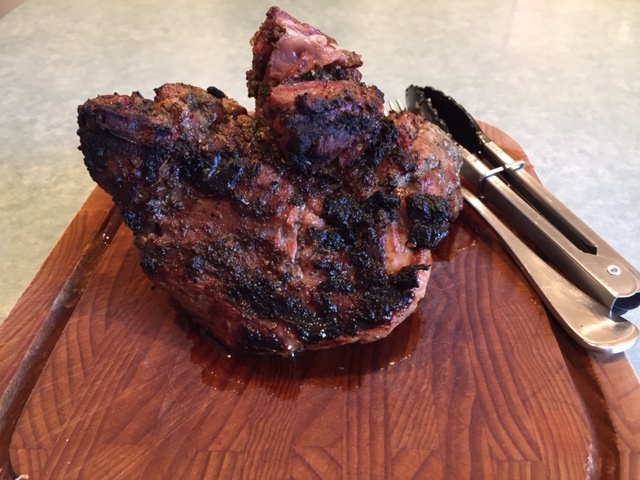 If you wanted to use this recipe to feed a large group of friends or family, you could use a whole boned leg, butterflied; double the quantity of marinade, give or take; roast the lamb for about 35 to 40 minutes; and char it much as for a smaller piece. 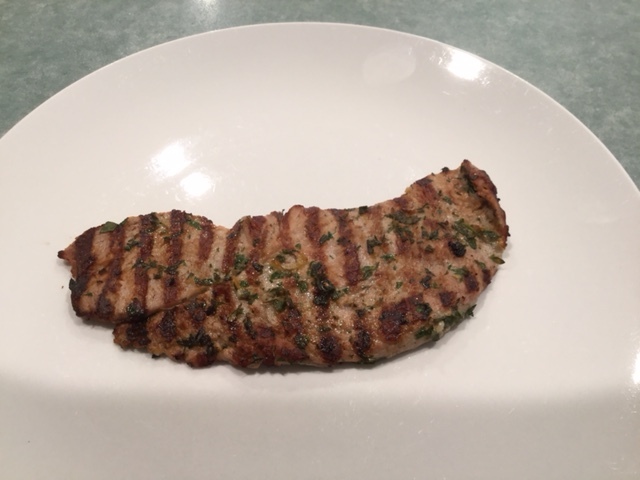 We are big fans of cooking with veal but veal is not your typical candidate for being chargrilled, especially by amateurs at home. However, inspired by a dining experience at a Turkish restaurant in our national capital, Canberra, we went looking for some tips on how to do it. The recipe we began with is here. 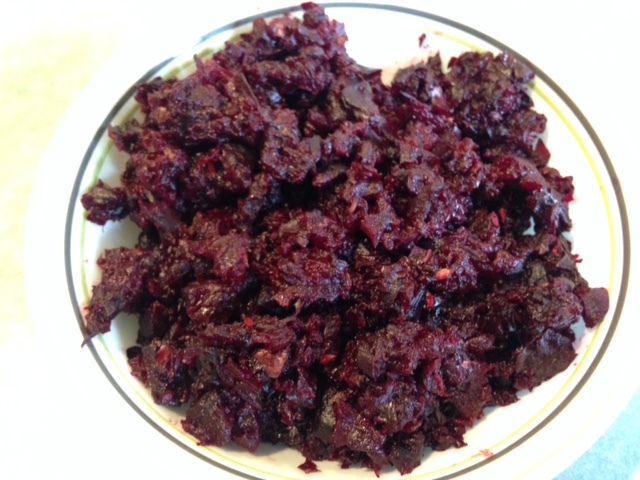 We have modified both the method and the relative quantities of the ingredients. The original recipe was from the USA and uses a cut of veal called ‘tenderloin’; I’m not sure what that is but it is probably similar to what is known in Australia as ‘escallops’ or ‘fillets’. These are mainly used to make dishes such as veal scallopini or, when coated with egg and breadcrumbs after being beaten thin, to prepare the classic wiener schnitzel. 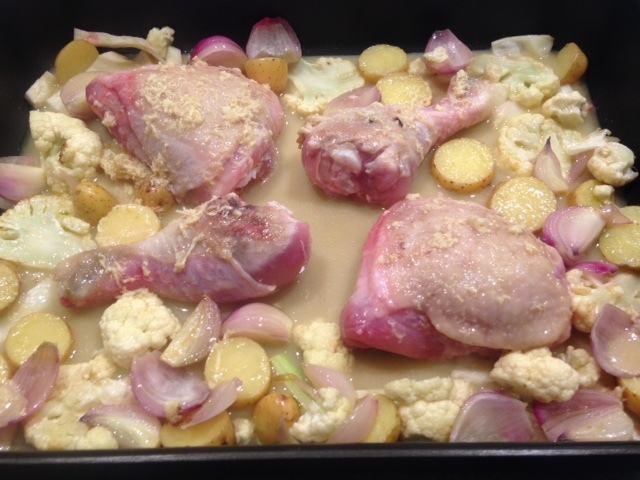 This will make enough for about 300g of veal, give or take, which is plenty for two middle-aged adults! 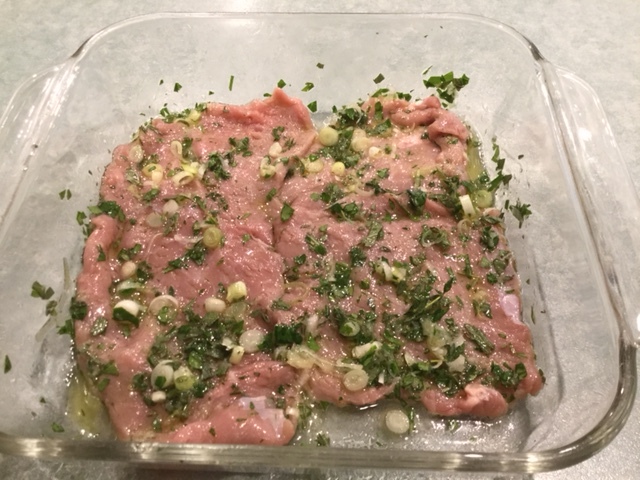 The tricky part is ensuring that the veal pieces are thin enough that they won’t end up chewy in the middle, yet thick enough that the marinade ingredients have time to cook without the meat drying out too much. I can’t give you a specific thickness for this – and I still get it wrong half the time – but it is somewhere between the ideal thicknesses for veal scallopini and wiener schnitzel, respectively. My apologies for the imprecision! 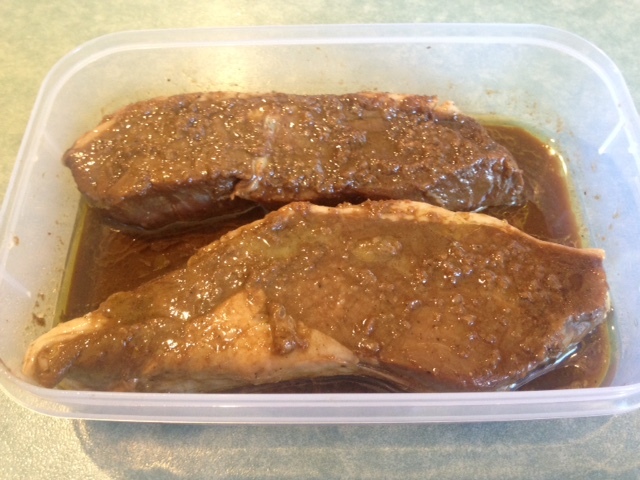 We coat the meat in the marinade two hours prior to cooking, cover it and refrigerate it for 90 minutes, removing it from the fridge for the final 30 minutes. Then you must get your grill to a very hot temperature, add the veal, cook it for exactly 4 minutes, flip it and cook for exactly 2 more minutes. 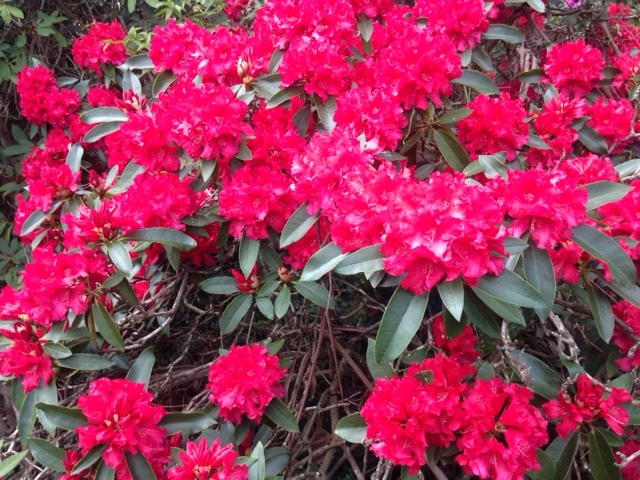 Here in Melbourne, we are in the last week of the calendar’s Spring. After complaining about the cold weather and needing to heat our home for much of the first half of November – the coldest start to the month in decades – we are suddenly in the midst of our city’s longest end-of-Spring heatwave in recorded history. Go figure! 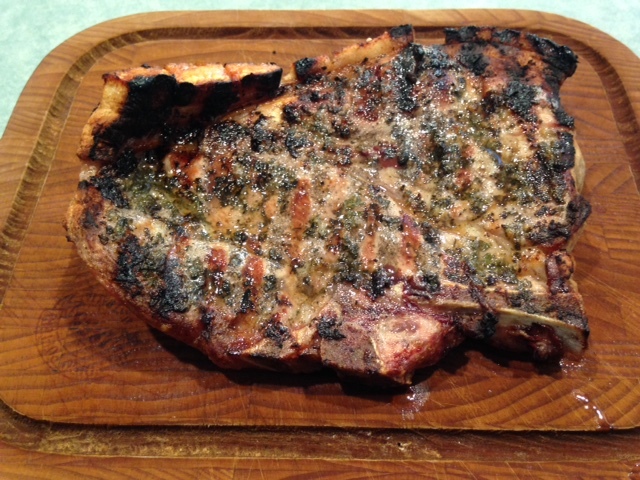 Naturally, we are now using our Weber Q to prepare the main elements of our evening meals. Until recently, the meats we char-grill on the Weber would usually be cuts from beef, lamb or chicken, as well as prawns or calamari from time to time. 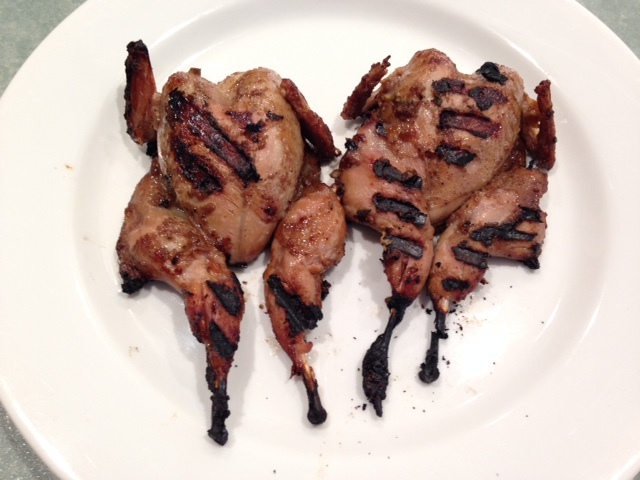 But over the last year or so, we have begun to add pork, veal and quail to the mix. 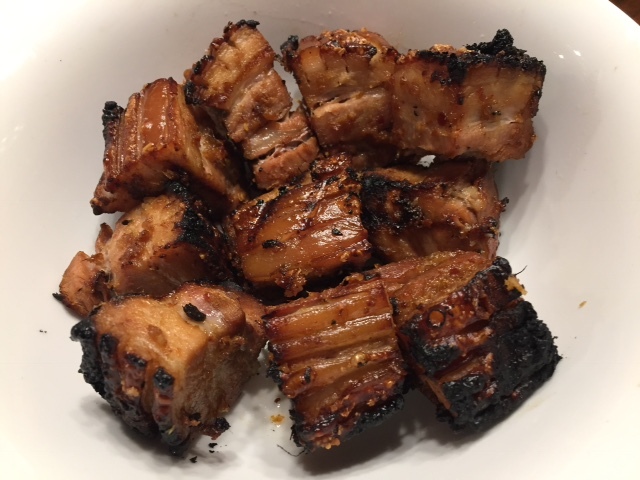 Last night, we cooked ourselves some cubes of pork belly, flavoured before grilling with a spicy paste. It was delicious and here is how we did it. As you know, pork belly has a high fat content, so we render much of that fat and enhance the texture of the meat by simmering it in a flavoured stock for an hour or so. I have previously posted the recipe for this procedure. Once the pork has cooled, we cut it into cubes, about 3cm x 3cm square. 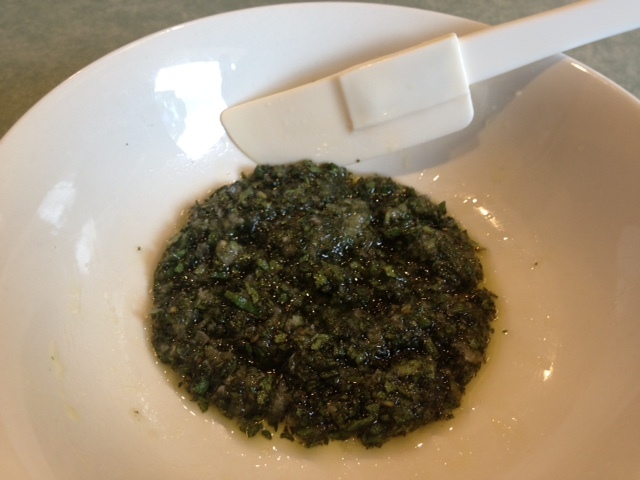 Then we apply the paste to the surfaces of each cube.You don’t have to do this very far in advance, as it is a superficial flavouring rather than a marinade; one hour is plenty. We set up our Weber for grilling but we place an open trivet on top of the main grill, to make it easier to manage the cubes as we cook them. 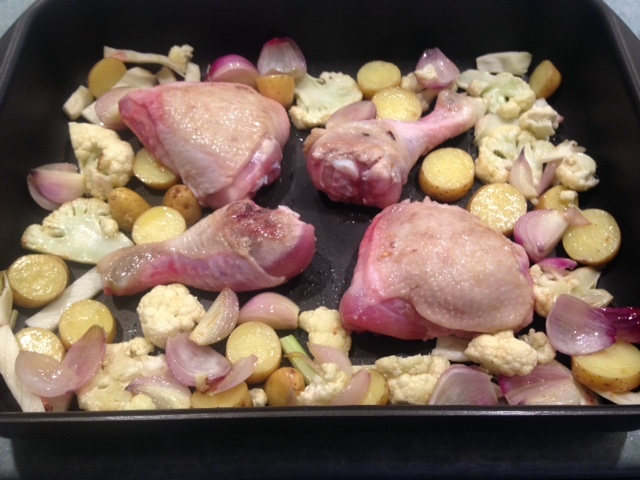 Once the temperature is quite high, say, 400C, we put the pieces of pork on the trivet, with one of the meaty sides facing down. After 5 minutes under the lid, we turn each piece, some of them going skin-side down, others as dictated by gravity!? 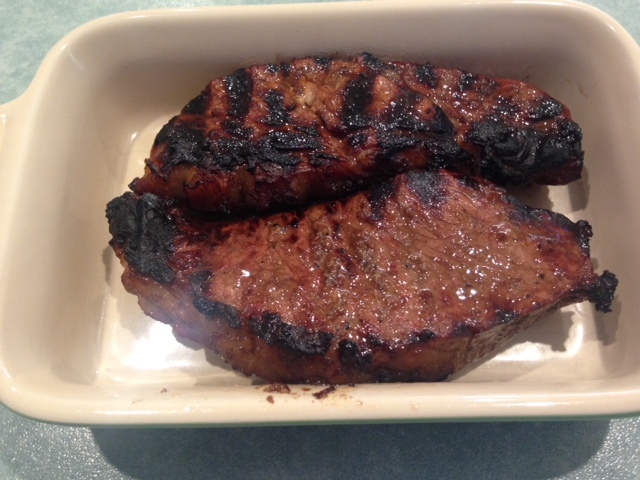 After a further 4 to 5 minutes, with some attractive charring, the pork cubes are ready to be taken off the grill. Here are some ‘before and after’ shots. We served them with two salads: shaved fennel & fresh orange segments with some vinaigrette dressing; and chunks of boiled, fresh beetroot dressed with a combination of sour cream, mayonnaise and grated horseradish. Place all the ingredients in a bowl and mix well. Leftover paste can be stored in a well-sealed container in your freezer. 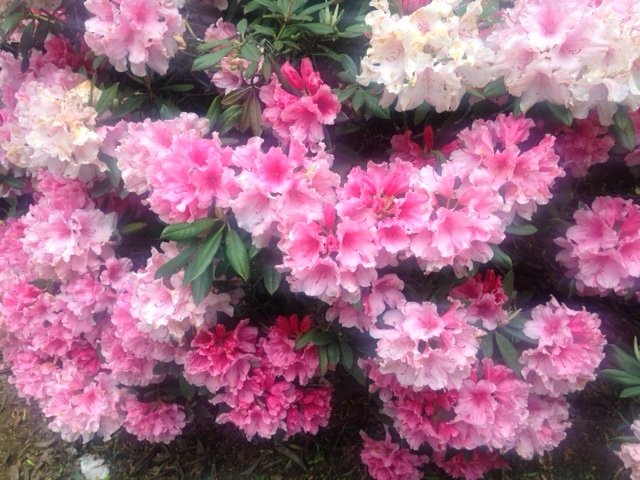 Not your typical variety of Australian national garden! 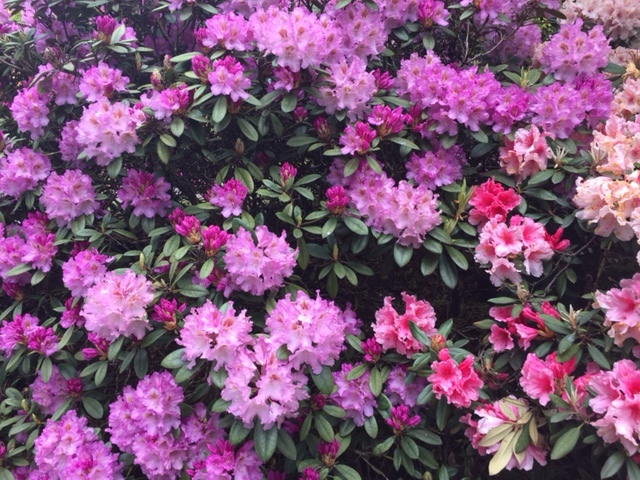 Here in Melbourne, we’ve had an atypical spring season. For much of September and October, the weather pattern was dominated by strong, cold winds, without the mitigating presence of good rainfall. 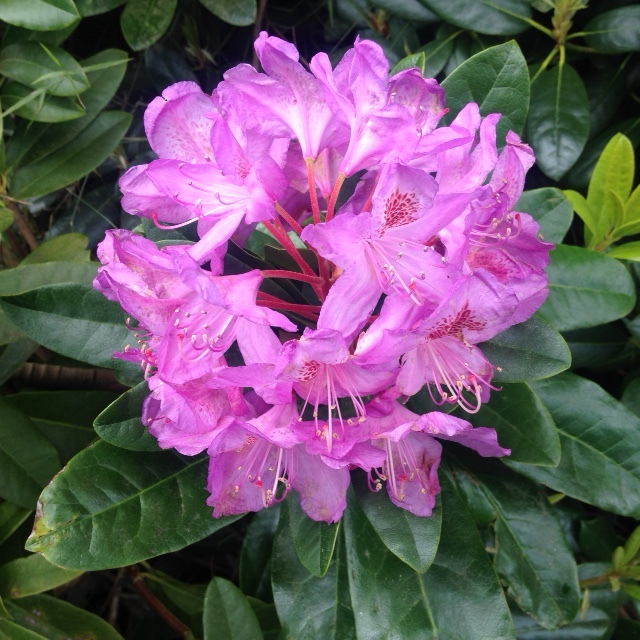 Then, late in October, we had a short burst of warm days, quickly followed by a cold, showery beginning to November. The coldest in 23 years, in fact! We decided to venture into a range of hills, known as the Dandenongs, which overlook the eastern half of Melbourne. Much of this range is covered with thick Australian native bush and tall forest trees, including some groves of temperate rainforest. 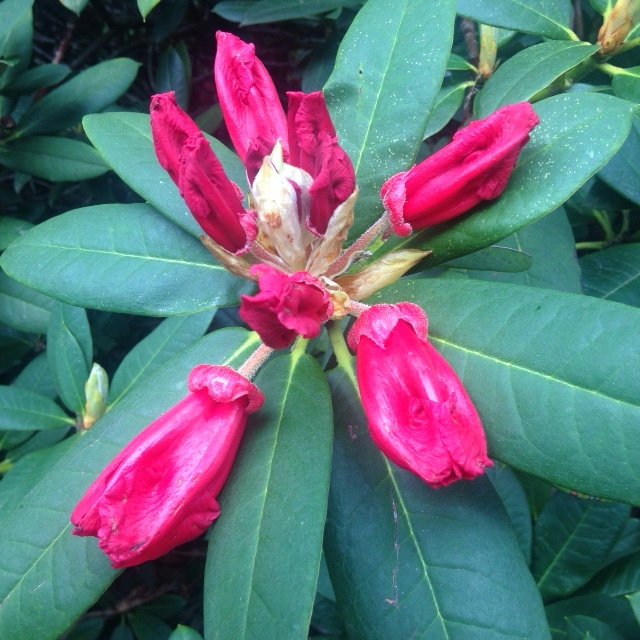 However, our chosen destination was a garden largely devoid of Australian plants: the National Rhododendron Garden. 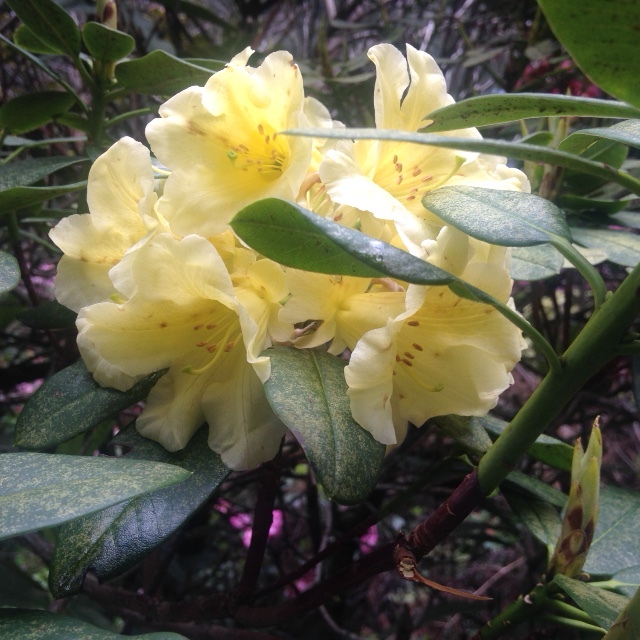 The soils and climate of the Dandenongs, with good winter rainfall and summer fogs, are well suited to growing rhododendrons and such related species as camellia and azalea. 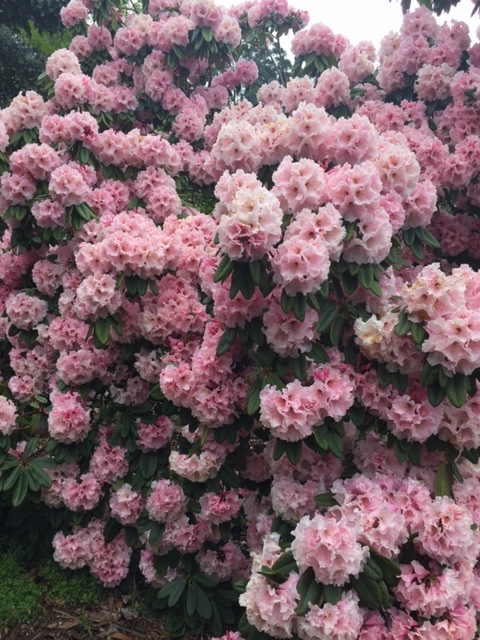 So, in 1960, a group of rhododendron enthusiasts persuaded the government of the day to set aside a large parcel of land which had already been stripped of most of its eucalypts and other native plants. 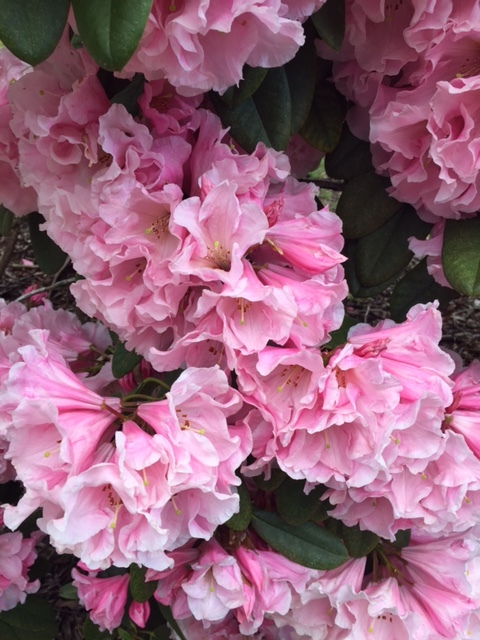 Soon, they had begun to create a garden planted with rhododendrons from the diverse regions of the globe to which they are native. More than half a century later, the garden has flourished to become a popular destination for both tourists and Melbourne residents. 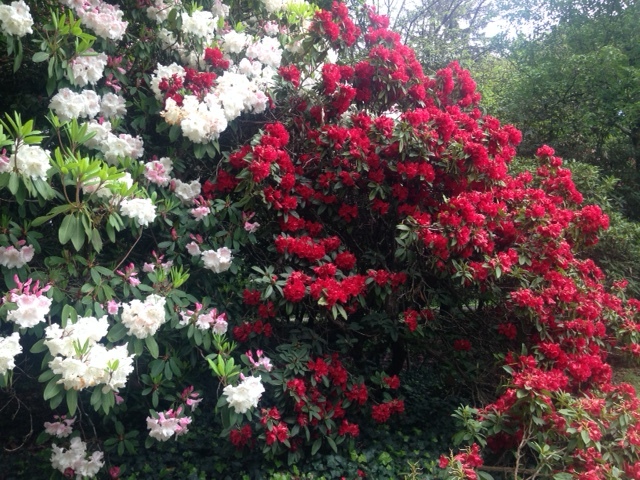 The garden is now managed by Parks Victoria and will soon be given the status of a botanical garden. You can learn more about the garden here. 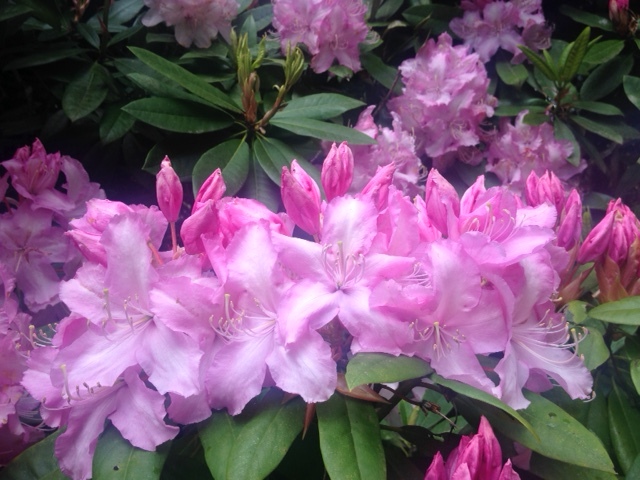 The grounds of the National Rhododendron Garden also contain numerous picnic tables , garden bench-seats, a cafe and a gift shop. Here are some more photos from the pleasant hour or so we spent wandering along the well-made paths. 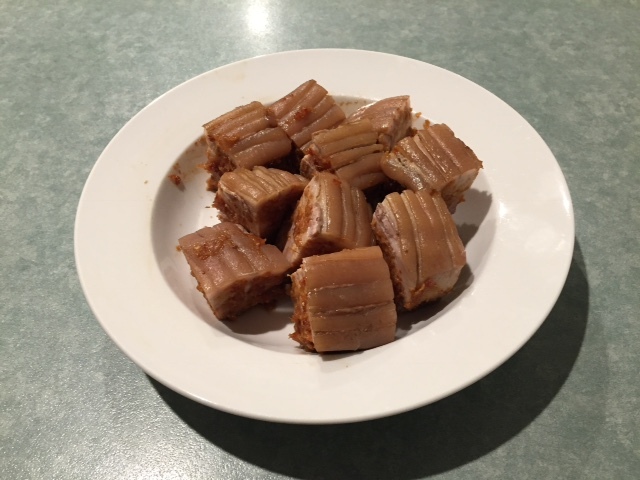 In the 1960s and ’70s, when Maggie and I were growing up in Melbourne, the food that was served during festivities associated with Christmas Day reflected the predominantly British heritage of the Australian population. Yes, the mass migrations from southern and central Europe following the second world war meant that there were thousands of Australians who adhered to different festive-food traditions, but we were blissfully unaware of them and our anglocentric media did little to enlighten us. The pudding, packed with a variety of dried fruits, would be full of flavour but it could also feel uncomfortably heavy in the belly. This was especially the case when the pudding’s fat content was derived from the beef fat known as suet. About 15 years ago, I twice made such puddings, ie using suet. It was a smelly exercise while the pudding was going through the hours of its initial cooking. However, it must have been an exceptional recipe, as I don’t have any other bad memories of it. Then I came across a recipe in an autobiography written by Ian Parmenter, an Australian television producer who was also an excellent cook. Ian’s recipe included ground macadamia nuts, which was the only source of fat or oil in the pudding. His other innovation was to use dark beer, or stout, as the main source of moisture. 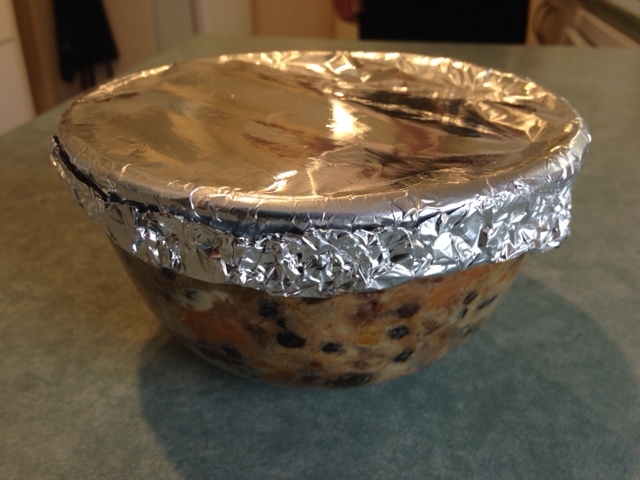 In deference to the indigenous macadamia nut, as well as the local dried fruits, Ian called it an ‘Australian Christmas Pudding’. 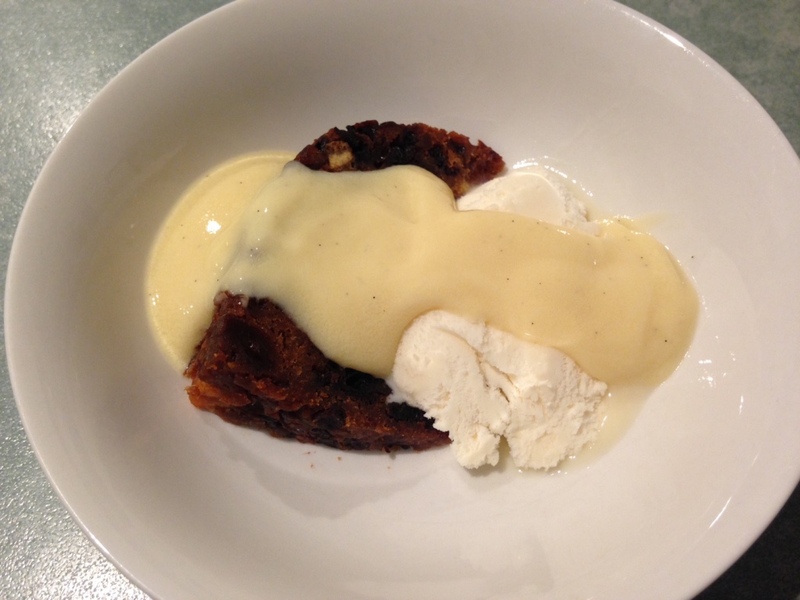 Within weeks I had made two puddings using Ian’s recipe. 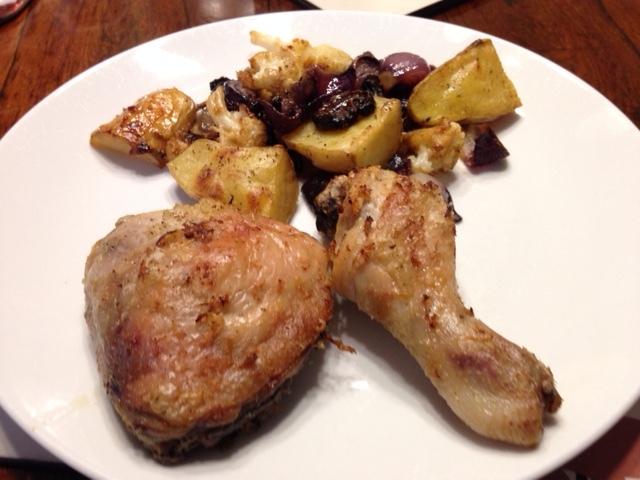 I was enchanted at how pleasant it was to prepare and cook, and how light it was to eat, compared to a traditional pudding. You can find the recipe here. The only changes I have made are to vary the spices – I use ½ tsp grated nutmeg, ½ tsp powdered ginger, ½ tsp powdered cinnamon; add the brandy to the pudding mix rather than flame it over the pudding before serving; and to cover the puddings with two sheets of aluminium foil rather than cloth. Maggie and I made a batch of the puddings ahead of the recent lunch we hosted for the 70th birthday of one of my cousins. Victoria is a vegetarian and we wanted to give her one of the puddings as a birthday present. 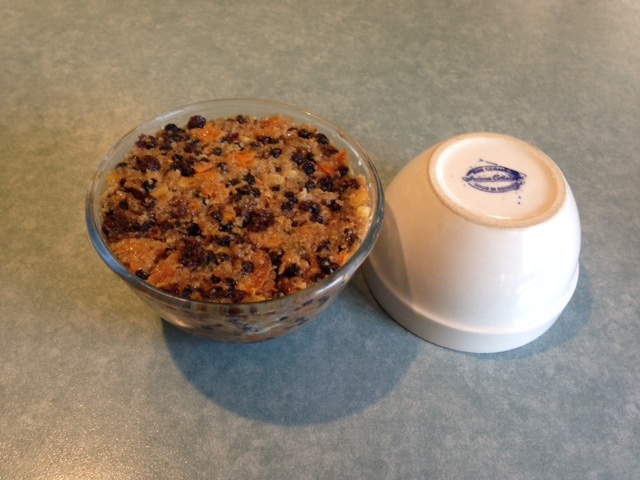 Last week we decided to heat up one of the two remaining puddings – the mix had stretched to three bowls – and enjoy it with friends who were coming for dinner before heading overseas for a month. To heat the pudding, I suggest you take it out of your fridge at least one hour beforehand and then heat just as if you were cooking it for the first time, ie in boiling water that comes at least half way up the outside of the bowl, for about 2 hours. We served it with some low-fat ice-cream and a good quality commercial vanilla-bean custard. It was delicious, as it has proven to be on three further occasions – it reheats readily in a microwave oven – but you do need to have some sweetness in the bowl to complement the tang of the fruit and the bitter edge of the beer. My late father’s father, who died well before I was born, was the oldest of four brothers. The youngest of those brothers, a renowned architect of the post-war era, had just the one child, a daughter Victoria, who was born in 1947. So, although Victoria is of my father’s generation, she is actually much closer in age to me. If you do the maths, you will find that Victoria has a special birthday this year; quite recently as it turns out. So, Maggie and I invited her and some other members of the extended Grounds family living in and around Melbourne to come to our home for a celebratory lunch, held last Sunday. Now, Victoria is a vegetarian, which is not a frequent category of dish in our household, especially when Maggie is sitting at the dinner table. However, we do have a favourite dish of open lasagne featuring cauliflower, mushrooms and hazelnuts. So we decided to prepare eight individual ones and make the pasta ourselves. 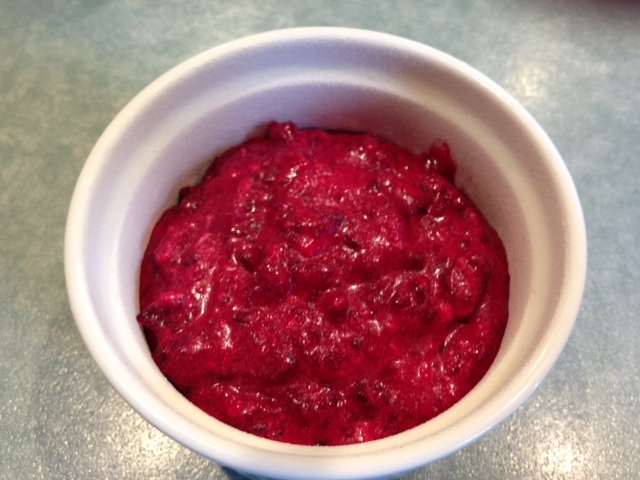 And I proposed that we make a starter of beetroot & feta terrine, using a recipe which I had road-tested when Maggie spent a few days with her son and his family a few weeks ago. Everyone else undertook to prepare either a salad or a dessert, to round out the menu. 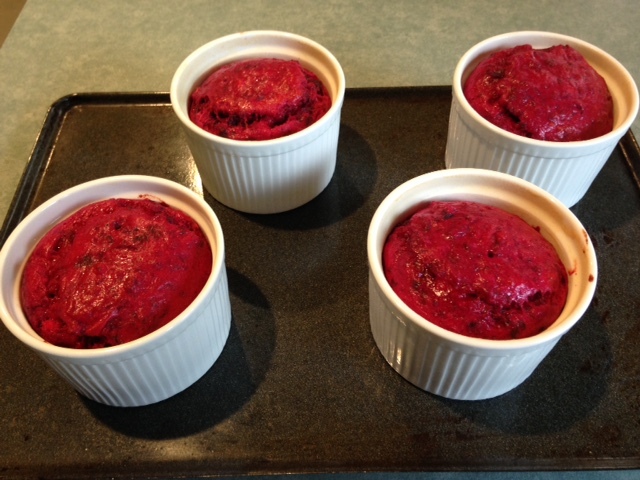 I found the original recipe, for beetroot and feta soufflés, on the internet. 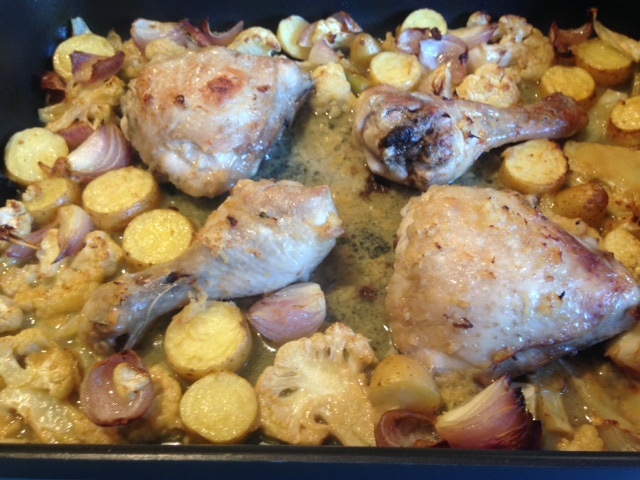 I made some changes from the outset, Maggie and I made further modifications in the lead up to the lunch and I have also formalised the various elements of the recipe. Here it is, followed by some photos which show some of the key steps, followed by the finished product, as served to our guests. 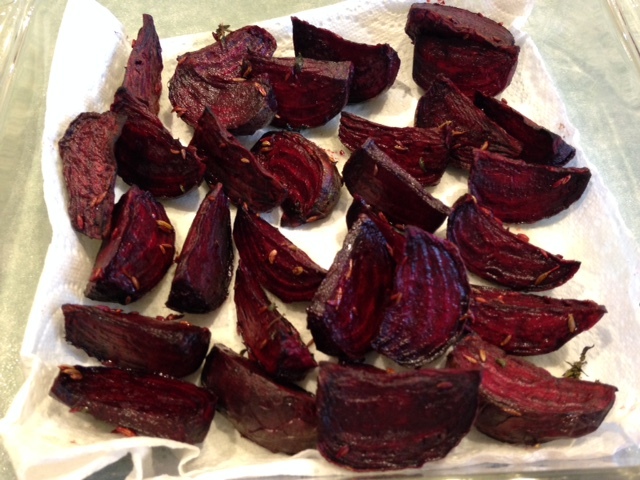 Toss beetroot wedges in olive oil, salt, seeds and thyme sprigs and transfer to baking dish lined with baking paper. 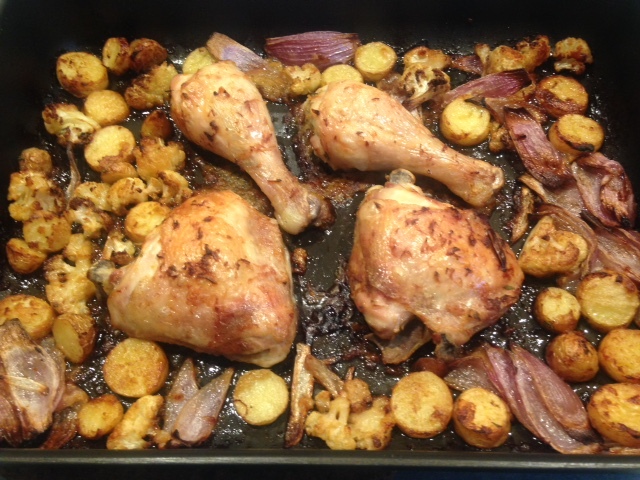 Roast for about 45 minutes, turning every 15 minutes, until they test just tender to a fork. 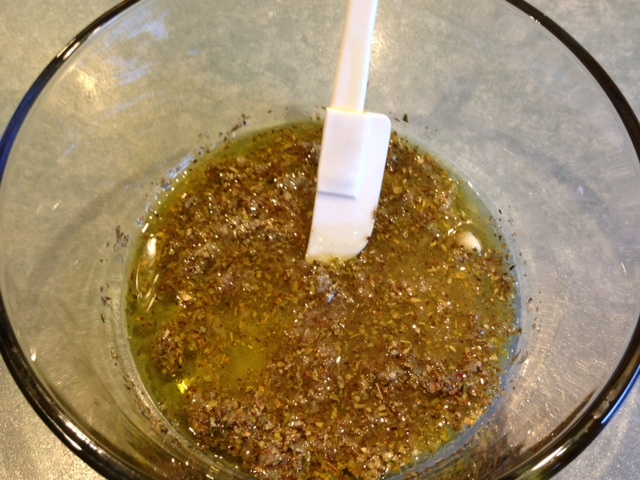 Melt the butter in a saucepan over a medium heat, add the flour and stir to cook for a minute. Off the heat, add the milk gradually; this is a thick sauce, so it will take a bit of work to make it smooth. Return to the heat and stir constantly until it has thickened. 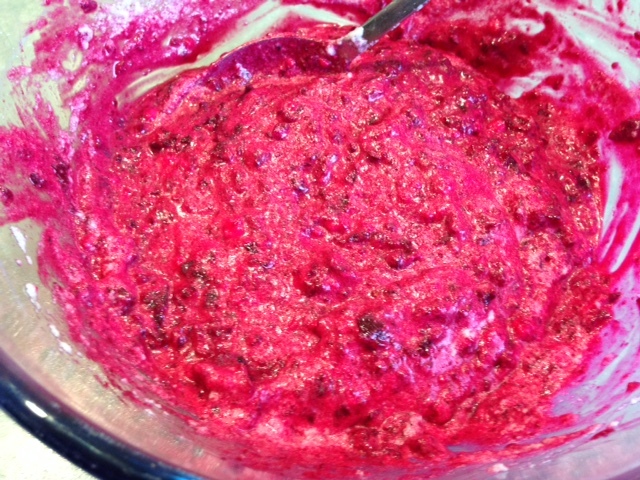 In a bowl, mix the sauce, nutmeg, pepper and processed beetroot together. Add the cheeses and the egg yolks and mix well to combine. Grease four 1 cup ramekins (three for soufflés), dust with plain flour and shake out any excess. 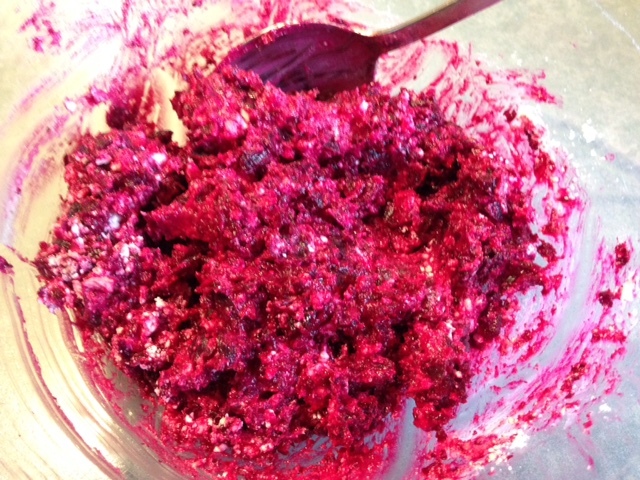 Whisk the egg whites until soft peaks form and gently fold them into the beetroot mixture in 2 or 4 batches. Divide the mixture evenly between the ramekins and bake in the oven for about 20-25 minutes. To serve as a terrine, place cooled ramekins in refrigerator for at least two hours, carefully remove the ‘soufflés’ and slice into wedges, about 10 per ramekin. The following five photos relate to steps 3, 4, 7, 9 and 10 of the method. Here are the cooked soufflés, fresh out of the oven. 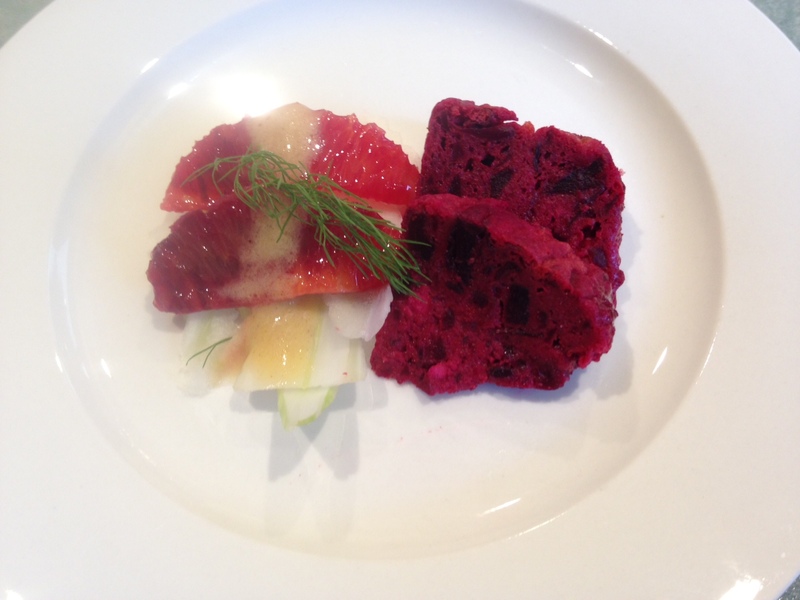 And here is how we served them at my cousin’s birthday lunch, with a refreshing salad garnish of shaved baby fennel, segments of peeled blood orange, a dash of vinaigrette dressing and a fennel frond. Quite pretty, and very delicious.